When we arrived in Paris we heard about this exhibition that was going to open to the public in a couple of days. Of course we would want to see it but we were sure we would never get in. From all we heard, getting into the Leonardo show in London was quite difficult with all the people who wanted to go. It was a total surprise when we came to the Louvre the opening morning of the exhibition and walked right in. The interest may build or maybe it is the idea of a whole exhibition focused on a single work makes people feel that it will be boring or that they will only see one work by the Master and it will be too scholarly. This in fact is not the case. 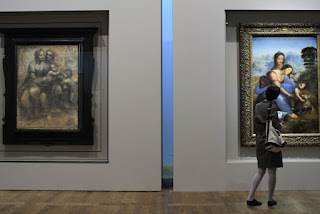 Aside from Leonardo’s painting of St. Anne you have one of the full size cartoons for the picture from the National Gallery in London. As an aside, in the 1960’s I saw the Cartoon at Burlington House. Then the cartoon was put up for sale and amid fears that it would leave the country it was acquired by the National Gallery in London. With all the publicity that the sale brought there were huge lines to see it, while there had been none before. The exhibition is wonderful. 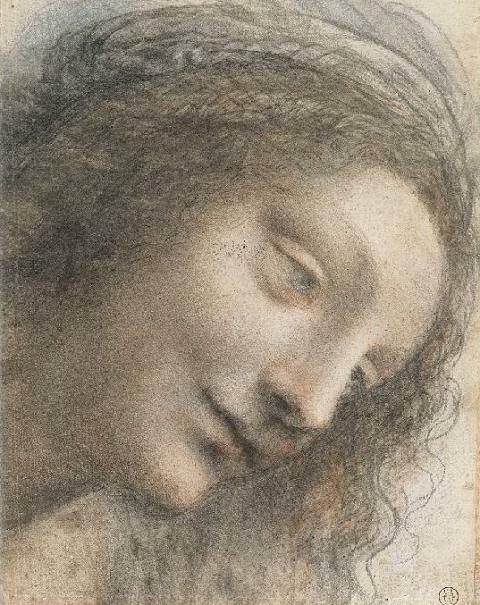 We were treated to 22 drawings by Leonardo lent by Her Majesty the Queen which directly related to the St. Anne. Most of these are limbs and fragments of garment. One of the best, if not the best, of the drawings was not lent by the Queen but by the Metropolitan Museum. It shows the head of the virgin and in context absolutely blew me away. Comparing this head with versions done by followers of the Master is an education in itself. The differences are so obvious that one feels like an instant expert! 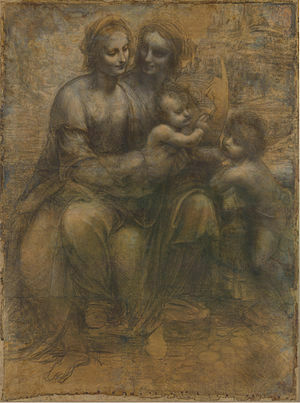 I love the fact that the exhibition is totally focused and commences with St. Anne, the Virgin and Christ Child as an ensemble through the ages before Leonardo, then most of the show is about the masterpiece itself. In fact, Leonardo never finished the St. Anne and had worked on it from 1503 until his death in 1519. During that time he had many changes of mind and many students to record them. As a result we can follow the artist’s thought process during these years. The most obvious change is the reversal of the figures in the composition and then there are changes in the attitude of St. Anne. We also get frequent radical and less radical changes in the background of the painting. The picture has been painstakingly cleaned and restored after years of research and analysis. Of course, this led to serious disagreements such as whether paint added later, possibly by the master, should be kept or cleaned off. The restoration was finished very shortly before the opening of the exhibition and I could imagine quite a bit of pressure to finally get it done. The result, however, in my opinion, is pleasing and the luminosity of the picture and its myriad of details has all been brought to the fore. After reaching the St. Anne itself we see a brief video about the development of Leonardo’s composition. 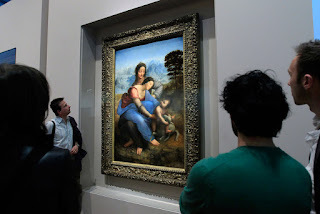 There are other related works such as Leonard’s Madonna of the Rocks which is in the Louvre collection. There is also the contemporary copy of the Mona Lisa which caused a great sensation after the Prado had it cleaned it and discovered it’s close relationship with the original. In my opinion, the picture has not been well served by the overzealous work done on it. Click here to read related ART NEWSPAPER article. The final segment of the exhibition is devoted to the influence that the painting has had since Leonardo starting with Michelangelo and ending with Max Ernst. As you have read here before I want exhibitions to be tightly focused with the material presented bringing me to a total understanding of the subject at hand and I found the exhibition most satisfying. I was only sorry that I would not have time to return to see it again.